The war for our attention - an existential threat. Earlier this month, Facebook and Instagram announced new tools for users to set time limits on their platforms, and a dashboard to monitor one’s daily use, following Google’s introduction of Digital Well Being features…In doing so the companies seemed to suggest that spending time on the internet is not a desirable, healthy habit, but a pleasurable vice: one that if left uncontrolled may slip into unappealing addiction. James Williams, a technologist turned philosopher has written a new book, “Stand Out of Our Light.” During a decade-long tenure at Google, he worked on search advertising, helping perfect a powerful, data-driven advertising model...Mr. Williams compares the current design of our technology to “an entire army of jets and tanks” aimed at capturing and keeping our attention. And the army is winning...This is us: eyes glazed, mouth open, neck crooked, trapped in dopamine loops and filter bubbles. Our attention is sold to advertisers, along with our data, and handed back to us tattered and piecemeal. The constant pull on our attention from technology is no longer just about losing too many hours of our so-called real lives to the diversions of the web. Now, they are telling us, we are at risk of fundamentally losing our moral purpose. Tristan Harris, a former design ethicist for Google…has been playing the role of whistle-blower since he quit Google five years ago…he notes that the constant pull on our attention from technology…is changing our ability to make sense of what’s true, so we have less and less idea of a shared fabric of truth, of a shared narrative that we all subscribe to…Without shared truth or shared facts, you get chaos — and people can take control. …a whole industry has sprung up to combat tech creep…HabitLab, developed at Stanford, stages aggressive interventions whenever you enter one of your self-declared danger zones of internet consumption…Like Moment, an app that monitors screen time and sends you or loved ones embarrassing notifications detailing exactly how much time has been frittered away on Instagram today, HabitLab gets to know your patterns uncomfortably well in order to do its job. Apparently, we now need our phones to save us from our phones. Sherry Turtle, M.I.T. sociologist and psychologist:…there is not only the attention we pay to consider, but also the attention we receive…Rather than compete with their siblings for their parents’ attention, children are up against iPhones and iPads, Siri and Alexa, Apple watches and computer screens…A generation has grown up that has lived a very unsatisfying youth and really does not associate their phones with any kind of glamour, but rather with a sense of deprivation. We’re starting to see people inching their way toward ‘time well spent,’ Apple inching its way toward a mea culpa…And the culture itself turning toward a recognition that this can’t go on. Some of the smallest, most useful machines known to science are the biological molecules that keep living things living. The protein myosin drives the contraction and relaxation of muscle. 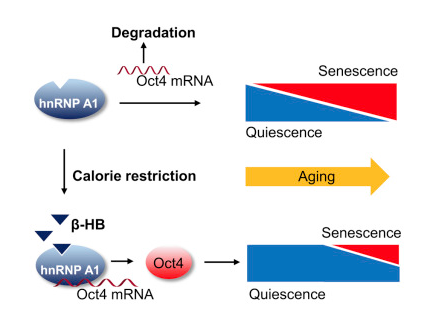 Kinesin drags cellular cargo around the cell. Motor enzymes unwind, rewind, and maintain DNA, and bacteria use a molecular motor to rotate their whip-like flagella up to 100,000 times per minute, propelling them forward. These machines turn chemical energy into motion. They’re very efficient at their jobs. The idea of using molecules to build minuscule machines that perform useful tasks dates back at least to a lecture given in 1959 by physicist Richard Feynman titled “There’s Plenty of Room at the Bottom.”* More recently, demonstrations of artificial molecular machines offer good reasons to think that such devices are feasible. Researchers have forged motors, shuttles, elevators, walkers, and pumps out of molecules, and powered them with electrical energy, chemical reactions, or light. Tiny motor by tiny motor, these demonstrations are inching toward future applications that could range from molecular electronics to artificial muscles. ...molecular machines are by nature floppy, like the soft matter that makes up the human body, whereas macroscopic machines are typically made from rigid materials such as metal. But it’s also a consequence of scale. Although the laws of physics don’t change in the nanoworld, their relative influences do. Concepts such as inertia and momentum—critical to the design of machines like cars and planes—become irrelevant. So does gravity, because molecules have such a small mass. Movement at the nanoscale is dominated instead by viscosity and Brownian motion, the random bumbling of individual molecules caused by thermal fluctuations...Katsonis calls this molecular environment a “Brownian storm.” In a 2007 article on the physics of nanoscale machines, physicist R. Dean Astumian at the University of Maine in Orono, ME, likened the challenges to swimming in molasses and walking in a hurricane. The article gives numerous examples of efforts to develop nanoscale motors driven by electrical energy, chemical energy, or light. Nummenmaa et al. do a massive job of data gathering whose purpose left me scratching my head on first sight...wondering why such an effort is useful. But then, if someone asked me how I would describe my subjective experience I wouldn't know where to start. In the introduction to their open source article they "use the word feeling to simply refer to the current, subjectively accessible phenomenological state of an individual...Despite the centrality of subjective feelings to ourselves and our conscious well-being, the relative organization and determinants of different feelings have remained poorly understood. " I pass on their abstract and a summary graphic from the article. Subjective feelings are a central feature of human life, yet their relative organization has remained elusive. We mapped the “human feeling space” for 100 core feelings ranging from cognitive and affective processes to somatic sensations; in the analysis, we combined basic dimension rating, similarity mapping, bodily sensation mapping, and neuroimaging meta-analysis. All feelings were emotionally loaded, and saliencies of bodily and mental experiences were correlated. Feelings formed five groups: positive emotions, negative emotions, cognitive processes, somatic states, and homeostatic states. Feeling space was best explained by emotionality, mental experience, and bodily sensation topographies. 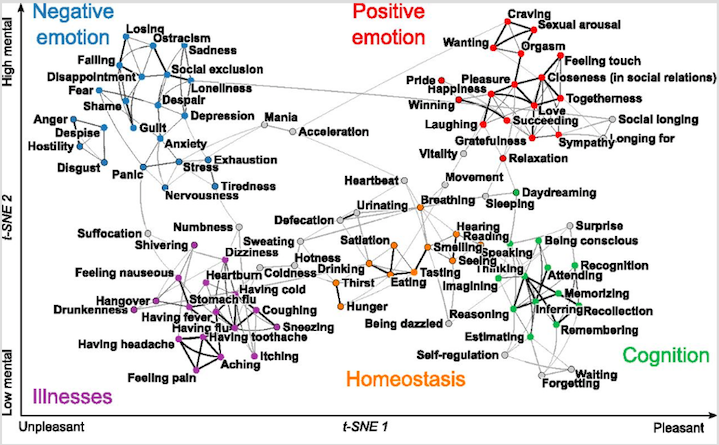 Subjectively felt similarity of feelings was associated with basic feeling dimensions and the bodily sensation maps. This shows that subjective feelings are categorical, emotional, and embodied. The narrative begins with the idea that companionate robots would be “better than nothing,” better because there aren’t enough people to teach, love and tend to people. But that idea quickly shifts into another: robots would be better than most anything. Unlike people, they would not abandon you or get sick and die. They might not be capable of love, but they won’t break your heart. From better than nothing to better than anything. These are stations on our voyage to forgetting what it means to be human. But the forgetting begins long before we have a robot companion in place; it begins when we even think of putting one in place. To build the robots, we must first rebuild ourselves as people ready to be their companions. We now glimpse the next steps in human cultural and cognitive evolution, continuing the trend that started with the arrival of human language and the (much later) invention of writing and the external storage and transmission of ideas. The new steps herald an age of fluidity and demand answers to a host of questions…The two most important such questions are simply: How should we negotiate this dauntingly large space of human possibility? And what costs are we willing to tolerate along the way? The first is a question of practice, the second of ethics. Practically speaking, it will not be easy to decide in a world of so many possible ways of being, so many enhancements and augmentations, and so many social practices, which ones are for us.